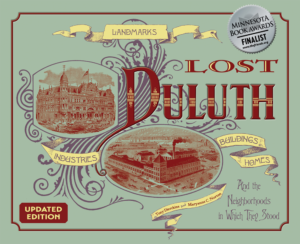 Like the Palladio Block, the Phoenix Block that stands in Duluth today is not the original. 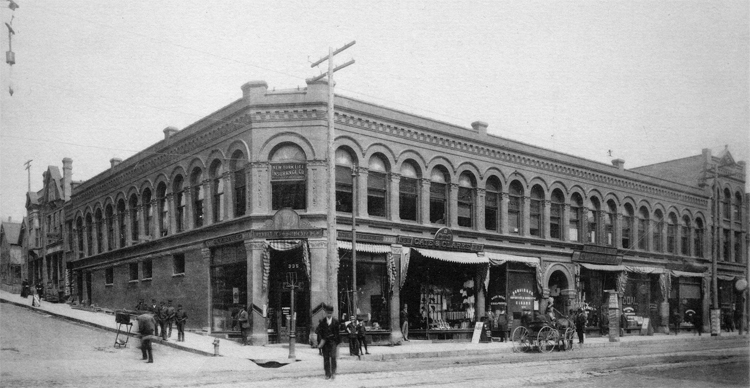 Built over the lot on which the Grand Opera House stood before it was consumed by fire, the Phoenix was so named because it “rose from the ashes” of what was then Duluth’s grandest architectural achievement. Like the opera house, The Phoenix’s main arched entrance was in the center of its Superior Street façade, and it also featured a diagonally cut corner entry to the Boyce Drug Store, which operated out of the Phoenix for many years. The Phoenix was a two-story red brick office building with arched windows on the second floor. Sometime in the 1930s metal paneling was applied over the brick façade. It was a popular location for professional offices until it was destroyed in a fire, believed to be arson, in December 1994. Officials told the Duluth News Tribune that the building could have been saved it if had been equipped with a sprinkler system. Its successor, also named the Phoenix Block, was built in 1995. Today the building’s chief tenants are a Starbucks coffee shop and the offices of the Duluth Superior Symphony Orchestra.